Oda was a Dane, born in East Anglia. 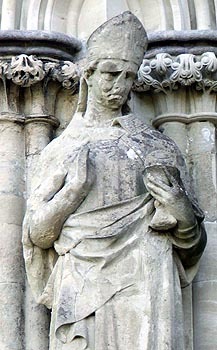 Adopted by one of King Alfred's nobles, Aethelhelm, by whose means he was baptised, and educated for the priesthood. King Aethelstan appointed him Bishop of Ramsbury & Sonning and, in AD 941, he was promoted to Canterbury. He repaired Canterbury Cathedral and laboured earnestly to promote virtuous living amongst his people. He admonished the King and the nobles to show justice, the clergy to be diligent in teaching and strict in their lives, and enjoining upon all the duty of keeping the Holy Days of the Church, of giving alms and of living together in peace and charity. He regarded, with disapproval, the marriage of King Edwig All-Fair with Aelfgitha, on the grounds that they were too closely related and thus caused them to be separated. His death took place on 2nd June AD 958.